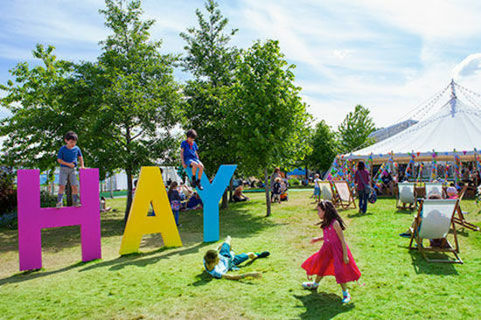 One of the world’s biggest literary festivals, the Hay Festival has attracted many great speakers over the past three decades, from Salman Rushdie to Bill Clinton. In eager anticipation of the festival’s 32nd year, we’ve collated 32 interesting titbits about the festival and its host town, Hay-on-Wye. How many of these did you know? 1. The Hay Festival is believed to have been founded around a kitchen table in 1987. 2. The town has been twinned with Timbuktu in Mali, since 2007. 3. Hay Castle is one of the few medieval defence structures in the country that is still standing. A local legend states that the castle was built by Maud Walbee, who carried the stones in her apron, building the castle in a single night. 4. Between 2016 – 2018, the festival delivered a £70m boost to the local economy. 5. Two former US Presidents have visited the festival in the past- Bill Clinton in 2001 and Jimmy Carter in 2008. 6. Hay-on-Wye's population is just under 1,600 (2011 census). 7. At almost 215km, the River Wye is the 5th longest river in the UK. 8. There are many other celebrations that take place in the town aside from the Hay Festival itself. Other festivals include Hay-on-Wye Food Festival, Hay Arts and Crafts Festival, Hay-on-Wye Horse and Pony Show and Hay-on-Wye Winter Food Festival. 9. Hay was listed as one of the best places to live in the UK in a 2017 survey. 10. Ian Dury, the late singer-songwriter, replaced the lyrics of his hit song "Hit Me With Your Rhythm Stick" at Hay in one of his last concerts: "From the gardens of Bombay, all the way to lovely Hay". 11. Over the last three decades, Hay Festival's audience has massively increased from just 1,000 visitors to over 250,000. 12. Hay has over 30 bookshops, meaning that in a town with a population of 1,600, that’s at least one bookshop per 55 residents. 13. On 1 April 1977, Richard Booth proclaimed Hay an independent kingdom and was crowned king and ruler of the new state. He named his horse prime minister. 14. Hay is said to be the world's first book town. 15. Hay fever is the name of the children’s version of the festival. 16. Despite its Herefordshire postal address, Hay-on-Wye is in Wales. 17. 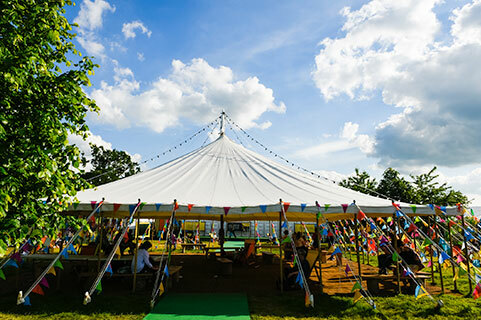 Many famous quotes have been recorded from the Hay Festival but arguably the most famous is when Hay was called "The Woodstock of the Mind" by former US President Bill Clinton. 18. Richard Booth opened his first bookshop in the town in 1962 and has been credited with putting Hay on the map as the famous ‘town of books’. 19. Hay’s position has led to it seeing many battles across the years. Hay castle has faced attack from both sides of the border and was destroyed by the English King John in 1216. 20. Owain Glyndwr, the Welsh nationalist hero, is believed to be buried in Herefordshire, a couple of miles from Hay. It is said that there are four possible burial sites: Monnington-on-Wye, Monnington Court, Croft Castle and Kentchurch. 21. The festival has been held at many different venues in the past, including the town's primary school. 22. The Hay Festival also runs wide educational programmes which support new generations of writers and audiences of all ages. 23. Hay lies on three borders. The national boundary with England, and the county boundaries of Brecknockshire and Radnorshire, which run through the town. 24. Before its bookshops and literary festival, Hay-on-Wye achieved infamy for all the wrong reasons in 1922 when Herbert Rowse Armstrong, a local solicitor, was hanged for his wife's murder. 25. The Three Tuns has been a popular drinking hole for both residents and visitors to the town. Famous speakers such as Jools Holland, Huw Edwards and Marianne Faithful have all made an appearance in the pub. 26. Hay’s only supermarket, the Co-op, is over the border in England. 27. Y Gelli, Hay’s welsh name, means “The Grove” and this appears on signposts around the district. 28. Hay has a unique duality as a result of being fought over by both the Welsh and the English. 29. There are now multiple Hay festivals in different locations around the world such as Peru, Mexico and Colombia. 30. People have occupied the countryside around Hay since the Stone Age. In 1959 and 1960 the pupils of Clyro Court secondary school uncovered over 2000 flint arrowheads at Old Forest Farm in Clyro. Also dating from this period is a chambered tomb near the entrance of Clyro Court, and Arthur’s Tomb in Bredwardine. 31. Nobel Prize-winners and novelists, scientists and politicians, historians and musicians have all spoken at the festival in the past, to a wide range of audiences. 32. King Offa of Mercia built a large earth wall in the second half of the eighth century in order to protect himself from the Welsh. The Offa's Dyke Footpath, which runs from South to North Wales along the border, follows this path. 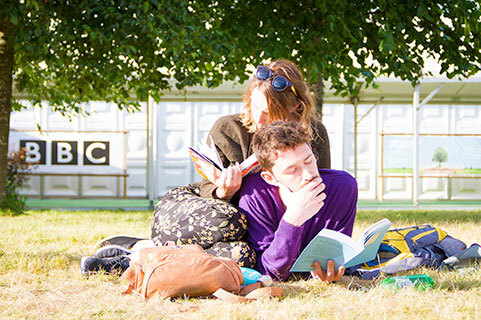 Serious Readers are proud to be sponsoring the Hay Festival for the third time. Click here to find out more about the new Serious Reading Room, featuring daily readings from festival speakers. Wow, I love the Hay Festival. Such a great place. Hi June. Thanks for your comment. Yes, we love it too, and can't wait to be there again this year. Lovely people, great surroundings, lively literary debate. What's not to love?